A savage storm leaves you shipwrecked on a remote South Seas island. But what first appears to be a tropical paradise quickly turns into a nightmare as you battle venomous spiderss and giant scorpions. Natural threats are not your only peril however, with the evil Witchdoctor and his cannibal minions hot on your trail as you try to make your escape; while looming over all is the steaming volcano which threatens to erupt and destroy everything in its path. 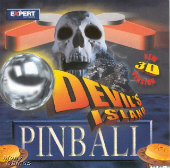 Devil's Island was intended to be a table for Pinball Wizards' game Balls Of Steel, but was cut out in favor of Duke Nukem. Eventually, the developers released it on its own as a separate game.